The introduction of steam power in 1857 gave the trade a much-needed boost although many companies had ceased operation by this time. Dundee had a growing jute spinning industry and this fuelled the demand for oil in the area. An extra voyage was also introduced before the whaling season began. It was to Newfoundland to take part in the annual seal hunts. This kept profitability high for a number of years and, in some cases was a more lucrative business than whaling. Large numbers of seals were slaughtered as they gave birth on the extensive Labrador ice pack. Dundee ships alone caught over 1,000,000 young and adult seals during a ten-year period. Steamers had opened up new areas. However, the decline in whale numbers eventually began to be felt in these areas also. The last custom-built vessel left the Stephen's Dundee Shipyard in 1884. Although no more ships were built for the trade a number were brought in from aboard to replace losses. By the 1890s, Dundee was the only port still operating whalers. In 1892 company owners took the ambitious if not risky step of sending a whaling expedition of four ships to the Antarctic. Unfortunately this trip was unsuccessful and did nothing to revive the dying industry. Right whales had long been absent from the southern waters. The rorqual species like the blue and fin whales were still present in large numbers. However, they were fast and powerful swimmers and were more than a match for open boat whaling techniques. A southern whaling industry to the Antarctic did however continue from Scotland. Trading stations manned by over-wintering crews were tried in the Arctic. It was thought that Inuit labour could be used and that skins and blubber could be stockpiled. These would be added to the catches of the whaling vessels. The intention being that the ships would service the station in the summer during its regular whaling voyage. Such shore stations did meet with some success, enough for them to be sold on to the Hudson's Bay Company when whaling activities ceased. Whaling was also becoming increasingly regulated. 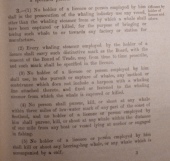 In 1907, the Whale Fisheries Act was introduced. Among other things, it stated that people required a licence to fish for whales. Arctic whaling came to a close in Scotland in 1912. Of the vessels that remained, two (Active and Morning) were lost during a storm on the way to Russia during the First World War. Another Balaena was sold as a hulk early in the 1920s. Eclipse was last seen in the White Sea being used for ice survey work for the Russian Government. Aptly Terra Nova, the last whaler to be built, was last to be lost, being sunk by a German U-boat in 1943.